FIND-R-SCOPE 1" Format, 50mm, f 1.8, C-Mount Lens with Manual Iris. FIND-R-SCOPE 1" Format, 75mm, f 1.8, C-Mount Lens with Manual Iris. 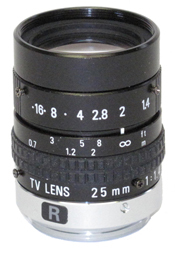 FIND-R-SCOPE 1" Format, 16mm, f 1.4, C-Mount Lens with Manual Iris. FIND-R-SCOPE 1" Format, 12.5mm, f 1.4, C-Mount Lens with Manual Iris. FIND-R-SCOPE 1" Format, 16-100mm, f 1.9, C-Mount Zoom Lens with Manual Iris.